We chose this beautiful rainbow patterned paving because it reminded us of the lovely colours found in Nepal and we hoped Hari would love it too – which he did. This paving is sawn, which means it is lovely and smooth – perfect for Hari to get around on in his wheelchair or prosthetic legs. 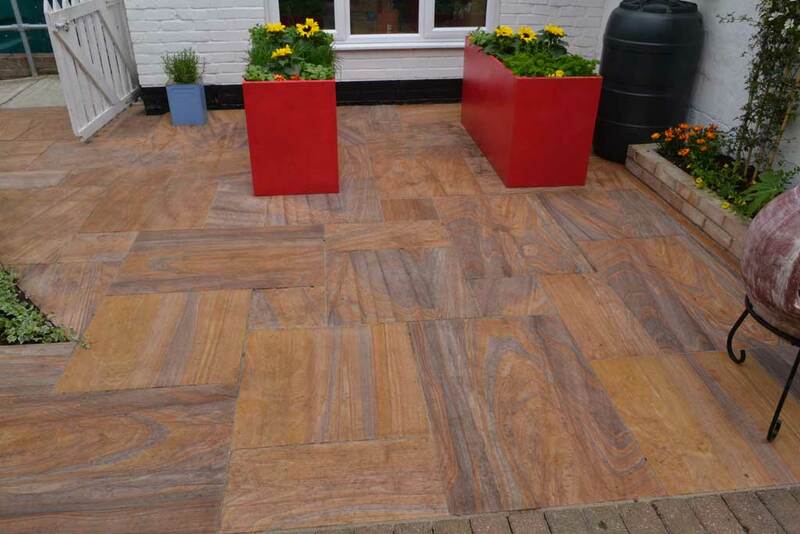 As the name suggests these Rainbow natural Indian sandstone paving slabs would bring lively and vibrant colours to everyone’s garden and patio. 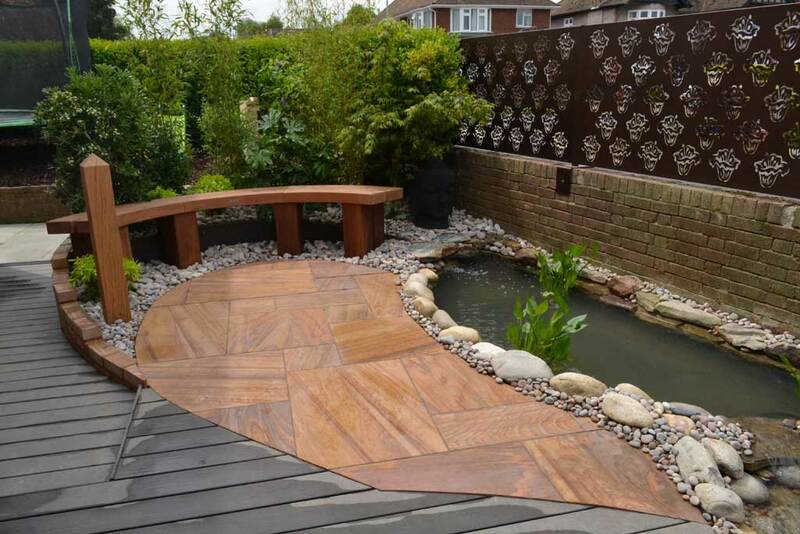 The wonderful shades enhance the appearance and add a character to Hari’s garden. They come in a variety of different size and thicknesses and at £19.99 per square metre – they are an absolute bargain! Pave Direct do a huge range of paving slabs – there is something for every taste and style. 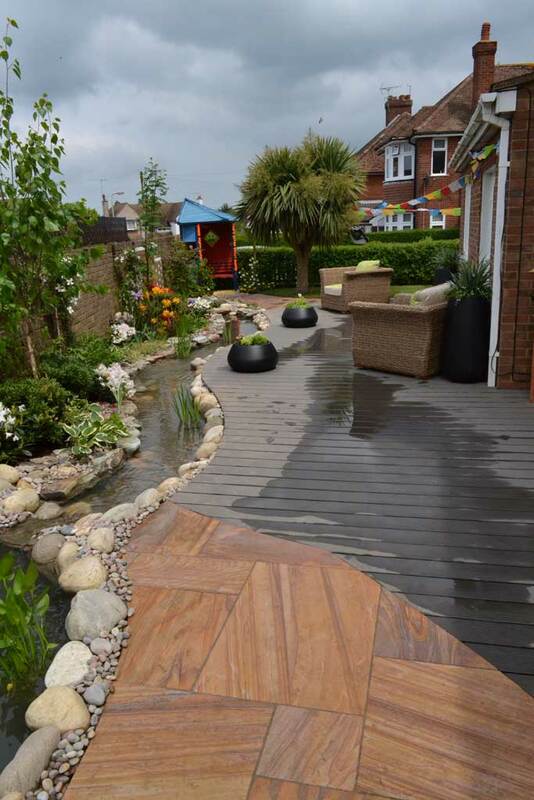 No Nepalese inspired garden would be without a stream and Hari’s was no exception. Two ponds – one at the top and one at the bottom made it look like a flowing stream. Of course, digging the holes and laying the liner is only part of building a water feature like this. Boulders, rock and cobbles from Decopak were used to edge the stream, which made it look completely natural. We used Scottish cobbles, Scottish pebbles and rustic slate rockery stone. Hari wanted his wife Urmila, to have somewhere she could pray in the garden. We found the Haven Arbour which was perfect for this. 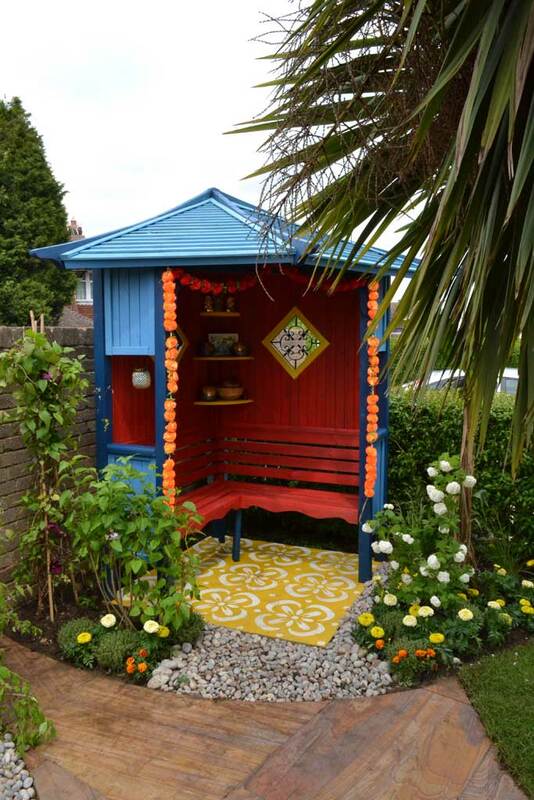 The team set to work turning it into a prayer house for her, but it also makes the perfect seating area in the garden. The Haven corner arbour from Rowlinson will fit in any corner that is roughly right-angled. It has 2 solid sides made from pressure treated timber, which is strong, weatherproof, and will provide excellent shade. With classic English country styling and ample seating, it will allow you to enjoy your garden with friends and in comfort. An excellent addition to any garden the Haven arbour has attractive metal detailing that finishes off the look wonderfully. Retailing from £499, please go to www.rowgar.co.uk for more information. We needed to give Hari more privacy in the garden, so the team at Decori suggested we use their decorative metal panels. They are incredible works of art as well as being really functional. Because the rhododendron is the national flower of Nepal, we commissioned Decori to create some panels to go on top of Hari’s wall, using a stylized rhododendron flower as the basis of the design. 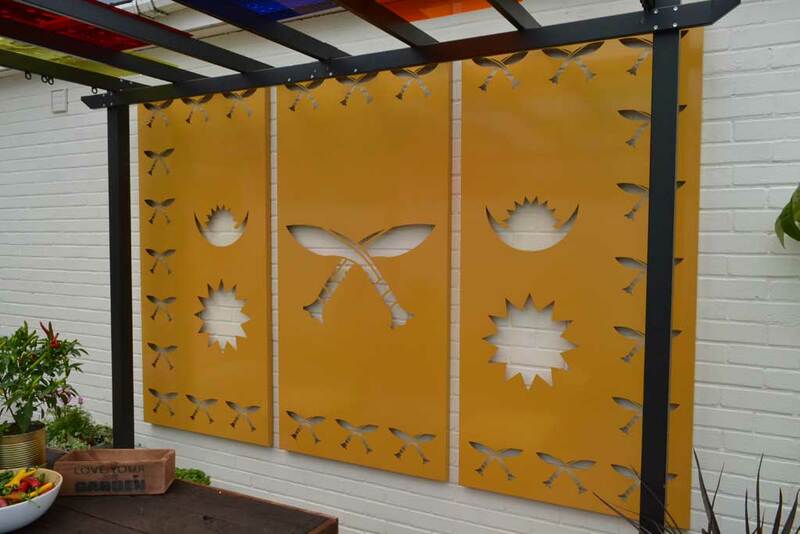 We were so impressed, we also got them to make 3 decorative panels showing the Kukri Knife – which is symbolic with the Gurkha regiment. Decori have a huge range of amazing screens, panels and pergolas. There is almost an infinite number of design styles which can be used on the screens – they have a library of them, or you can commission or create your own design. There are also a large range of paint or metal finshes. We wanted to give Hari a special, peaceful are in his garden for him to relax in. We needed to find a curved bench to set this area off and the people at Woodscape really came up trumps with this curved bench. It is a high-quality seat, combining a simple, natural appearance with a robust construction. Manufactured in Naturally Very Durable Hardwood, seats are supplied fully assembled with a choice of surface fixed (SF) or built-in 200mm below ground (BI). The Seat Type 2 Curved is supplied in standard lengths of 2000mm or 2500mm. – we chose the 2000mm curve. The 2000mm curved seats have a radius of 5m, whilst the 2500mm has a radius of 7m. Retailing from £499, this is one bench which will certainly stand the test of time. 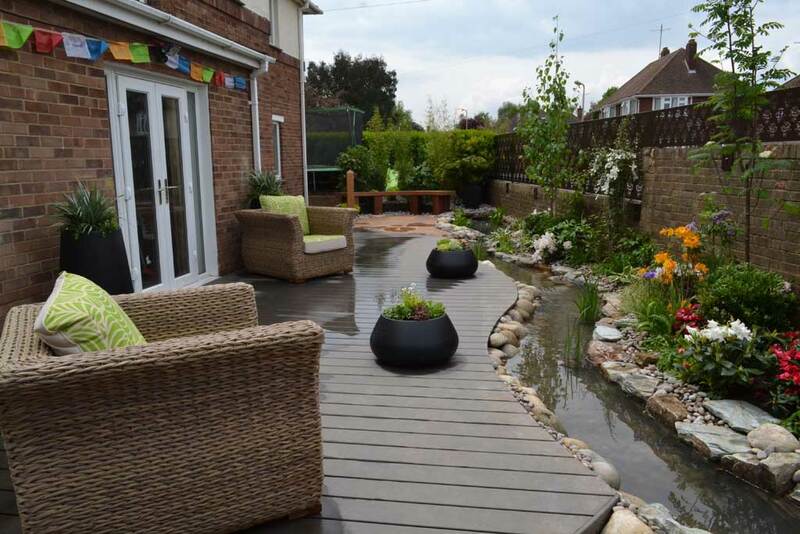 We needed to create a decked area to run level from Hari’s house and then ramped down to the lower part of the garden. It was essential it was hardwearing, slip resistant, longlasting and attractive. A composite deck – one made from wood fibres and polymers, was the number one choice for us and Megawood didn’t disappoint. It also has fantastic environmental qualities, it is incredibly important to use recycled or sustainable resources where we can. The material is natural wood fibres from sustainable forests and high-quality polymers and additives — can be supplied back to the regular megawood production process. It is available in a variety of sizes and colours. All components are PVC-free and can be recycled in the megawood recycling circuit after their service life is over. This protects the environment and saves natural resources at the same time. And: Unlike some terrace woods from the tropics, the origins of the wood used by megawood are assured. All their wood comes from sustainable and environmentally compatible forestry and bears the PEFC seal as proof of origin.